4x4 Styling is a Trading name of. X3 E83 2003 - 2010. X6 E71/E72 2008 - 2014. X5 E70 2007 - 2012. Coupe S111 2007 - 2009. Santa Fe 2001 - 2006. Santa Fe 2007 - 2012. RX 200T / RX 450h 2015+. GL X164 2006 - 2012. ML W164 2005 - 2012. Lancer Evo 2004 - 2007. Navara D40 2005 - 2015. Land Cruiser 120 2003 - 2007. RAV 4 2006 - 2013. 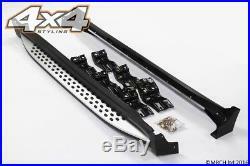 For Chevrolet Captiva 2007+ Side Steps Running Boards Set - Type 4. These side steps will make a great addition to your Chevrolet Captiva 2007+. These high quality side steps are made from very strong steel, aluminium and plastic. 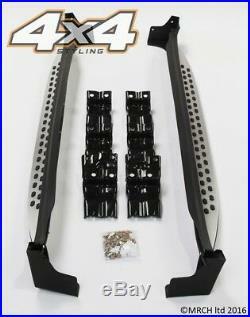 They are very sturdy and an excellent item to help step up into and down out of your vehicle. They are supplied with black round PVC anti-slip grips running along the aluminium step plate. Supplied as a set of 2 (left side and right side) with fixing brackets and bolts. They look great and offer excellent functionality, assisting entering and exiting the vehicle. IMPORTANT: This item is designed to be bolted on using the existing holes in the chassis. You may need to cut the plastic under tray or sill trim to allow the brackets to be installed, this is standard practice for vehicles with an under tray or large plastic sills. This item is not supplied with fitting instructions. We strongly recommend professional fitting. We have a great relationship with all our couriers and strive to offer the best possible service for all our customers. We will dispatch your order on the same day if check out if completed by 14:00 GMT. We have been working closely with our tried and tested couriers for many years. We know we can offer the best service, at the best price for most countries worldwide. 4x4 Styling is a brand name of MRCH Ltd. All payments are to be made payable to MRCH Ltd. It is the customers responsibility to bare the cost of the return of any item to us. We must receive the package back in the same condition we sent it out. MRCH LTD are not responsible for any additional costs as a result of a faulty product, unless prior consent is given in writing by a member of staff. For Chevrolet Captiva 2007+ Chrome interior air vent strips trim set. For Chevrolet Captiva 2011+ Chrome Headlight Lamp Surrounds Trim Set. For Chevrolet Captiva 2007+ Chrome Wind Deflectors Set (4 pieces). For Chevrolet Captiva 2007 - 2011 Chrome Tail Light Trim Set. We are a fast growing company based in North Dorset, UK. We specialise in4x4 and crossover vehicle parts and accessories ranging from roof bars to mud flaps, side steps to skid plates. To hear about latest news & offers. The item "For Chevrolet Captiva 2007+ Side Steps Running Boards Set Type 4" is in sale since Wednesday, April 18, 2018. 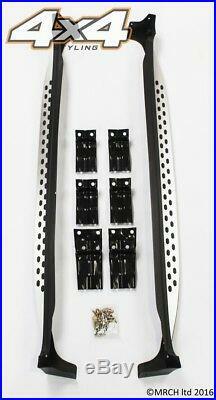 This item is in the category "Vehicle Parts & Accessories\Car Parts\Exterior & Body Parts\Running Boards". The seller is "alternativemotorsport09" and is located in Shaftesbury.